Etsuko Furuya for Echino Cameras B. Cameras Green with Yellow Polka Dot border. JG-99700 701 B25 Fabric Details 45% Cotton/55% Linen 44/45" wide. Lightweight Canvas. Etsuko Furuya for Echino Cameras B. Cameras Gray with hot pink polka dot border.JG-99700 701 C20 Fabric Details 45% Cotton/55% Linen 44/45" wide. Lightweight Canvas. Etsuko Furuya for Echino Acacia. Natural background with teal green and purple trees. JG-95800 800 A. Fabric Details 45% Cotton/55% Linen 44/45" wide. Lightweight Canvas. Etsuko Furuya for Echino Zebra. Striped fabric with zebras on chartreuse gray bias stripes purple strips purple dots and aqua floral shape. JG-99510 11 C. Fabric Details 85% Cotton/15% Linen 44/45" wide. Lightweight Canvas. 25mm webbing by Echino. Seafoam stitches on blue webbing. ECH-13. 92% Acrylic, 8% Polyester. Echino Fabrics. JG-96500-501D. 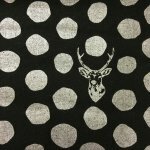 Metallic silver dots and deer heads on a black background. Fabric Details 45% Cotton/55% Linen, 44/45" wide. Etsuko Furuya for Echino Piece. Multicolored Patchwork. 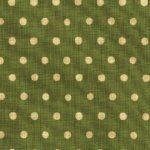 JG-95800 801 A26.�Fabric Details 45% Cotton/55% Linen 44/45" wide. Etsuko Furuya for Echino. Dot Dot Dot. Cream on Moss Green. JG-95000-504E. Fabric Details 45% Cotton/55% Linen. 44/45" wide. 25mm webbing by Echino. Blue stitches on brown webbing. ECH-9. 92% Acrylic, 8% Polyester.